In order to have a clearer understanding of the main factors behind how peasant movements scale up agroecology, LVC is carrying out self-studies directed at systematizing successful scaling-up experiences protagonized by peasant movements. This paper, produced as part of the self-study process, specifically examines Zero Budget Natural Farming (ZBNF), a grassroots peasant agroecology movement in Karnataka, India. ZBNF ends reliance on purchased inputs and loans for farming, positioning itself as a solution to extreme indebtedness and suicides among Indian farmers. The ZBNF movement has achieved massive scale not only because of effective farming practices, but because of a social movement dynamic – motivating members through discourse, mobilizing resources from allies, self-organized pedagogical activities, charismatic and local leadership, and generating a spirit of volunteerism among its members. Karnataka is a southwestern state in India. Nearly 56 percent of the workforce in Karnataka is engaged in agriculture and related activities. Agriculture in Karnataka is dependent on the monsoon, and drought has become frequent. The main crops grown in the state are rice, millet, maize, pulses, oilseeds, cashews, coconut, arecanut, cardamom, chilies, cotton, sugarcane, tobacco, coffee and silk. ZBNF falls under a larger tradition of farming in India, called natural farming. There are teachers from other parts of India who promote similar principles but not at the same scale. Most have some combination of Gandhian principles, the Japanese natural farmer Fukuoka’s teachings of ‘do-nothing’ farming, and traditional farming methods. ZBNF first came to Karnataka when a senior farmer leader from Karnataka Rajya Raitha Sangha (KRRS) came across Palekar in the neighboring state of Maharashtra in 2002. He invited Palekar to Karnataka and organized a couple of workshops through KRRS. After an encouraging response from farmers, KRRS started to promote ZNBF through its organization, becoming the medium through which ZBNF first spread across the state, mirroring the experience of CaC in Central America and Cuba. The presence of such social networks, KRRS leaders argue, made Karnataka a receptive arena for the initial success of ZBNF. 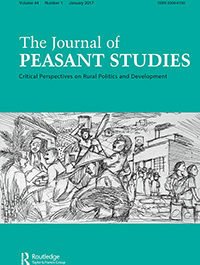 Visit the Journal of Peasant Studies to access the full version of the paper.